The original hardcover version is now out of print. Please check out the revised paperback edition and the new audio book edition! ! Jeff's first book for children (ages 10 and up)! Come explore the spooky world inside the White House! It’s one of America’s most famous and haunted homes, so keep your eyes wide open for darting shadows, ghostly apparitions, and lurking creepy creatures. We’ll hear true, scary stories from past Presidents and First Ladies, as well as from staff who work there every day and have had the chance to see it all. It’s the perfect election year book; as adults decide who will move in, kids can enjoy thinking of what the new inhabitant might encounter in the building’s many rooms and hallways. Has the original landowner decided to stick around? Is Abigail Adams still hanging laundry on the premises? Does President Andrew Jackson still make a ruckus up in the Rose Guest Room? Is Abraham Lincoln a permanent fixture in the bedroom that bears his name? Every one of these figures, and others, has been spotted or heard from. To increase the chills, a variety of archival images and original illustrations capture the hauntings. 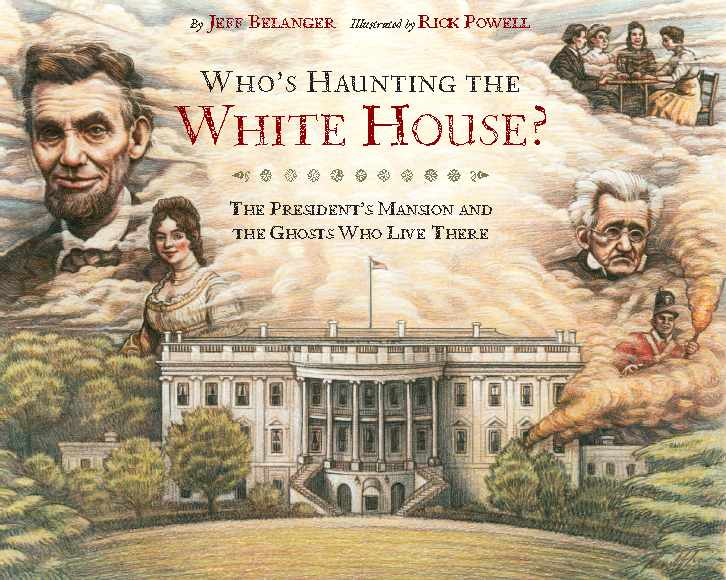 In addition to ghost-hunting, kids will learn about the real history inside the White House. Who's Haunting the White House? was masterfully illustrated by Rick Powell. You can visit his Web site at: www.studiopowell.com. Read reviews of Who's Haunting the White House? January 7, 2009 - School Library Journal - "The Road to the White House"